Critical to this new economy, Kelly suggests, is the concept of ownership. “Ownership is the underlying architecture of our economy,” she writes. 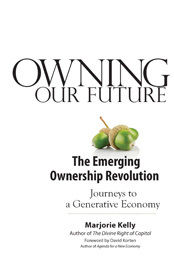 “How ownership is framed is more basic to our lives than democracy.” In the following excerpt from Owning Our Future, Kelly discusses what ownership means to the global economy – and to her personally. As significant as different patterns of ownership are, they’re hard to see, because they’re deep structures lying beneath the surface of things. I learned about the importance of ownership from my father, and it was a lesson he delivered not in words but with the arc of his own life. I grew up in a family of eight children, raised fairly comfortably on my father’s single salary from the small business he owned in Columbia, Missouri. My maternal grandfather owned his own company, as did many of my uncles. When I was a child, no one in my extended family was rich. they owned my father’s business, our house, and a few other pieces of real estate. It was enough that when my father died at the young age of 62, my mother was able to live at ease for decades without working outside the home. There was no shortage of emotional dysfunction in our household (including a good bit of Irish Catholic drinking and stormy tempers). But the economic security we enjoyed helped my siblings and me to mature into stability. In a visceral way, I experienced financial security as a form of nurturance, as vital as food or shelter—something that sustained me and allowed me to thrive. If I saw the positive side of ownership as a child, I saw its negative side at Business Ethics, a magazine I cofounded in 1987 and where I served as president for 20 years. In that time, I watched corporations rewrite the social contract. I saw mass layoffs shift from something companies did in a dire emergency to become ordinary practice. I watched companies I once admired hire union-busting consultants. In five short years, I saw the number of Washington lobbyists double. I watched wages flatline and the proportion of taxes paid by corporations fall. When the scandals at Enron, WorldCom, Adelphia, Parmalat, and other companies broke out, it became clear that cooking the books had become disturbingly widespread. At every turn, companies claimed to be acting in the interests of their owners, their shareholders. Ironically, the owners supposedly demanding those acts were us, all of us with investing portfolios holding stock in corporations, all of us who have children attending colleges with endowments, all of us who support churches, museums, and nonprofits that rely on donations paid for from financial holdings. We’re all tangled up in our system’s ownership designs. And we’re all tangled up in the messes they’ve left in the economy and the biosphere. Because we’ve yet to grasp how the crises we face are symptoms of deep structural problems, what lies ahead may be worse still. Wanting to help in the search for alternatives, a number of years ago I sold Business Ethics and moved to the Tellus Institute in Boston. There, my colleague Allen White and I cofounded the initiative Corporation 20/20, bringing together hundreds of leaders from business, finance, law, government, labor, and civil society to explore alternatives to the dominant corporate form. That work confirmed my growing conviction that ownership is the root issue. I remember a particular moment when it snapped into focus for the whole group. It was 3 p.m. on a Friday and the energy in our group was flagging. Seated around the conference table were 30 of the most innovative thinkers I knew, all struggling to stay awake. If the topic we’d come together to explore, redesigning capitalism, was a worthy subject, by late on a Friday it was a boring one. We were in day three of our time together, in the third of these gatherings. It had begun to feel like we were half-crazed survivors dragging ourselves through one jungle of impenetrable concepts after another: stock options, Delaware law, fiduciary duty, and more. I looked around the table, thinking, we’ve got to get these people into a break. They need coffee, fast. There was a pause, the nodding of many heads. Some chatter of agreement. Then the facilitator called for a break. Yet no one left the room. No one even touched the cookies wheeled in at the back. You would have thought the coffee had been delivered intravenously. The room was so alive with animated talk that it was as though we’d been huddled in a dark cellar, and someone had opened a door and thrown on the lights. The energy in the group was back because we’d touched the root issue that defines corporations and capital markets today. It’s ownership. Ownership is the gravitational field that holds our economy in its orbit, locking us all into behaviors that lead to financial excess and ecological overshoot. During my work with Corporation 20/20, my premise was that the answers were about redesigning corporations. But then my Tellus work shifted to a new project with the Ford Foundation involving rural communities, and I began looking at forms of ownership that didn’t involve corporations at all. I studied shared ownership and governance of homes, farms, forests, wind farms, fishing rights, and more. As I discovered more and more models, I realized that I’d found my way to the edge of a movement much larger than corporate redesign. Something is emerging that goes to the root issue, the institution with which civilized economic life began, back beyond the age of industry in the age of agriculture. That root issue is ownership. We are witnessing its spontaneous evolution. In both the United States and the United Kingdom, there’s burgeoning interest in social enterprises, which serve a primary social mission while they function as businesses—like Greyston Bakery in Yonkers, New York, an $8 million profit-making business started by Zen monks with an aim of creating jobs for the homeless. Community development financial institutions (CDFIs)—which in the United States provide financial services to under-served low-wealth communities—are growing by leaps and bounds. In little over a decade, assets have climbed from $5 billion to $42 billion, with new funds coming from depositors, investors, and government grants. Emerging experiments with catch shares, ownership rights in marine fisheries, have been found to halt or reverse catastrophic declines in fish stocks. Conservation easements now cover tens of millions of acres, allowing land to be used and farmed even as it’s protected from development, preserving it for future generations both human and wild. In Quebec and Latin America, among other places, there’s a growing movement for the solidarity economy—consisting of cooperatives and nonprofits—which in Quebec has gained formal recognition and government funding as a distinct sector of the economy. And a surprising number of large corporations have adopted mission-controlled designs. Among these are the foundation-owned corporations common throughout northern Europe, such as Novo Nordisk, a Danish pharmaceutical company with $11 billion in revenue, as well as Ikea, Bertelsmann, and other large companies. Also included in mission-controlled designs are family-controlled companies with a strong social mission, such as S. C. Johnson and the NewYork Times. More exotic designs are also popping up, like Grameen Danone, a social business in which village women in Bangladesh sell yogurt through a joint venture between multinational yogurt maker Groupe Danone and Grameen Bank, the fi rst microfinance lender. The enterprise is designed to improve the nutrition of the poor as it aims to pay investors a modest, 1 percent dividend. These social architectures are harbingers of something profoundly new. They aren’t yet fully formed, not yet ready to serve as the framework of a new social order. But their growing profusion is a signal. It tells us that we’re entering one of the most creative periods of economic innovation since the Industrial Revolution. For what’s at work isn’t economic innovation as it’s usually meant, which is about better and better ways to make more and more money. This innovation is almost unimaginably more profound. It is a reinvention at the level of organizational purpose and structure. It is about creating economic architectures that are self-organized around serving the needs of life. Marjorie Kelly is a fellow with the Tellus Institute in Boston and director of ownership strategy with Cutting Edge Capital. Kelly cofounded Business Ethics magazine and Corporation 20/20. She specializes in ownership and financial design for social mission. Owning Our Future: The Emerging Ownership Revolution can be purchased from Berrett-Koehler, Amazon or at local book stores.